This is a scan of the instructions for Bob Haskell's novel card trick. This trick was featured regularly in old Owen catalogs. If you have a deck of blank-face cards; you can easily make this trick, after reading the instructions. An effect with the twang of the old west, the Dalton Boys is a clever combination of several magical principles blended together into a mystifying and highly entertaining presentation. The patter in rhyme supplied has an interesting plot, which builds to a logical climax. EFFECT: Four picture cards (Jacks) representing the infamous Dalton Boys, are each placed into a glass or cup which represents a cell. With each outlaw is placed three blank face cards to represent guards. Four other blank cards represent the rendezvous of the Daltons. 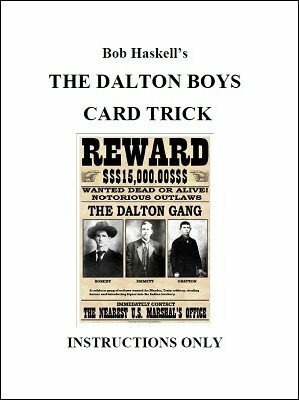 Now one by one the Jacks vanish, and one by one they reappear on the blank rendezvous cards, completing the escape of the Dalton Boys. 1st digital edition 2016, 2 pages.